Damage initially appears as chlorotic spots, but most of the fronds eventually become brown and desiccated. 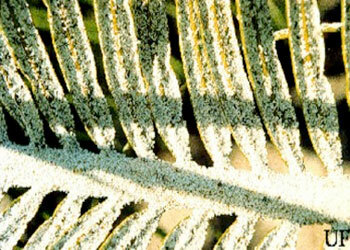 Highly infested cycads are almost completely coated with a white crust that includes scales of live and dead insects. The scale insects are consistently more numerous on the lower than on the upper surfaces of leaflets.